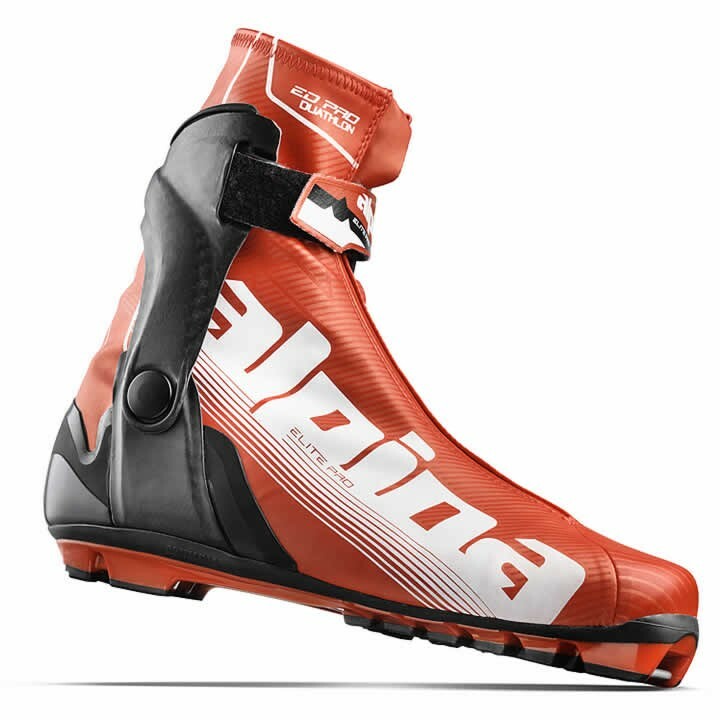 The Alpina ED Pro, an elite level duathalon boot, features a classic style flex and a torsionally stiffer carbon cuff. Ideal for elite level racing or the recreational nordic skier looking for one boot to satisfy both classic and skate disciplines, the ED Pro offers a lightweight construction and precise fit. NNN Xcelerator: Top racing sole with neutral foot position provides more direct power transmission; light with optimized flex and torsional stiffness. Carbon: A light anatomic carbon cuff delivering exceptional stiffness, lateral stability and responsiveness. Equipped with a power strap for optimal ankle fit, superior comfort and adjustable ankle grip. Carbon + TPU Heel Counter: Carbon stabilizer provides torsional and heel counter stability inside and out; in combination with TPU adapts to various types of heel shapes. All combine to deliver excellent grip and foothold.